I signed up for the Double Iron to make sure I didn’t get too fat and lazy over the winter. Plus, having a big race early in the year is a nice platform to jump start the year. I did the necessary training but didn’t give a lot of thought to my nutrition. That cost me dearly during the race and ended up taking 2 naps for a 27:49 finish for 6th place. 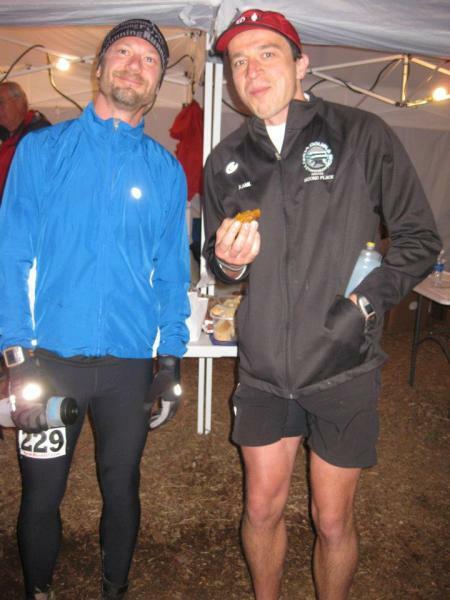 Potawatomi 150 was almost a disaster when a group of us went out fast for the first 50 miles. Potawatomi 150 was almost a disaster when a group of us went out fast for the first 50 miles. I took my first sleep at 60 miles because of going out too fast. I ended up taking 2 more naps in the 48 hours of that race. I’ve become accustomed to napping during races and am going to try this year to get minimal to no sleep during Potawatomi. I’d like to see how many more miles past 150 I can get in before the 52 hour cutoff this year. 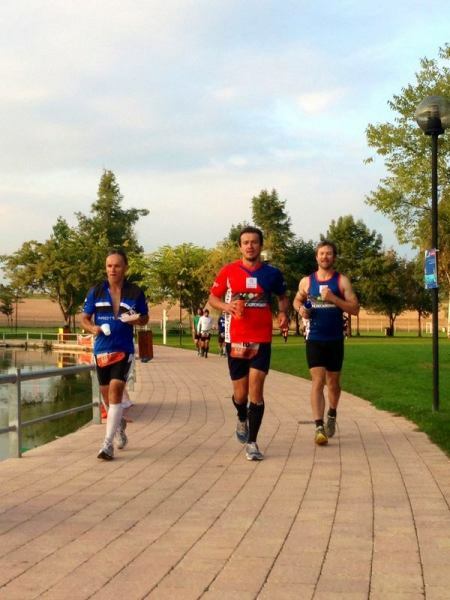 The run across Illinois was to raise money for a Chicago-based charity called Chicago Run. That charity’s mission is to implement programs in schools to get our children more active. The 410 mile staged run took us a week and was truly an incredible experience. Starting in Kentucky, a group of 4 of us ran north towards the Wisconsin border. After a few days and a mechanical malfunction with our crew car, 2 of us were left, Shan Riggs and me. The main crew/pacers were Scott Kummer, Scott Smoron, Tony Cesario, Brian and Kelly Gaines, Karen Shearer, Jennifer Leslie, Tony Weyers, Joy Avery, Alfredo Pedro, Evelyn Santos, Joe and Joeliezer Ventura, Julie Bane, Tina Pascolla, Hersh Ajgaonkar, James and Cindy Faford, Kamil Suran and others I’m sure I forgot. The temps were hot and when the rain stopped after the first 4 days, I was overheating and developed a strange colored bruise on my leg. A couple days later my knee started swelling up and running was no longer an option for the last 25 miles. Getting to the border was brutal that last day, walking in the sun. Kamil and I started hitting each other with a stick. After feeling the same pain for 7 days, it was nice to feel something different, even if it was a different sort of pain in a different part of the body. I also needed the comic relief that only hitting your friend with a stick can bring. I could not have gotten across the state without all of the crew and pacers. Finally, the record attempt in Italy was to see how many consecutive Ironmans we could do over a period of 30 days. 20 of us attempted this race and remarkably, 8 men finished all 30 days. Kamil and I both dropped in the first week. While he came back a few days later and did the last 20 days, I struggled and sporadically did a couple here and a couple there for a total of 13. Most of my purpose for finishing the other 3 events earlier in the year, was to create a mindset for finishing the Italy race, however, every day of racing became increasingly difficult for me. I don’t think I was spiritually fit enough to endure the stress of those 30 days of racing. Karma isn’t usually convenient. On top of relationship issues and moving just before the race, the stress of racing felt compounded, with plenty of time spent in my own head to think about how I ended up where I was and what direction my life was going. I always seem to get the question, “Why do you do these ultra races? Why ?” That is always a question I ask myself during these events as it gets difficult to continue. And as a result, I become accustomed to asking myself that about life. Why do I work here, live here, eat this, have these hobbies, etc. Some people say they learn more from their dnf’s than from their finishes, but in my case I learned more from the run across Illinois. Sometime between days 5 and 6 in the run across Illinois, I began hearing things. The insects were telling me I couldn’t finish and the birds were telling me I could. I mentally broke down at that point and I began asking myself the why question, not just about running but about life as well. I realized that asking that question was vital to becoming a better person and living an authentic life, something I needed at that point and still do. Recently, those questions have resurfaced. It’s cool that I can do ultras and persevere through tough times, but can I do that in the rest of my life? If I can run across Illinois with courage, integrity and grace, do I live the rest of my life that way? I look back and see my life’s decisions over the past few years and how far off track I’ve gotten from what I would consider an authentic, courageous life. That is not the life I want. It’s easy to be vague about the specifics, but a couple of years ago I made a monumental mistake and hid that from the people around me. When that happens, we tend to hide and protect the mistake in order to save face. Only after being honest is the veil pulled away and the situation can be seen and evaluated for what it really is – not what we’ve been falsely portraying it to be. So my answer to why is actually the question itself. Asking the right question gives perspective that can be the beginning of positive change. Hindsight is 20/20 but only if I look. And just like an ultra, succeeding requires making good decisions.